This is kind of a secure door for you web or mobile application. It gives a APIs, and/or cloud services with always-on reliability, high performance, easy scalability and simplified connectivity to your applications. Deployed to the edge of Microsoft’s global network, Front Door gets your application delivery story right to the doorstep of your users. With anycast, and using Microsoft’s massive private global network, users can accelerate their applications and directly connect to Azure deployed backends. This cost a very low latency and higher throughput to your end users. Users can build their application with more reliable aspect across regions and and users are now capable of having “always-on” web site availability experience. 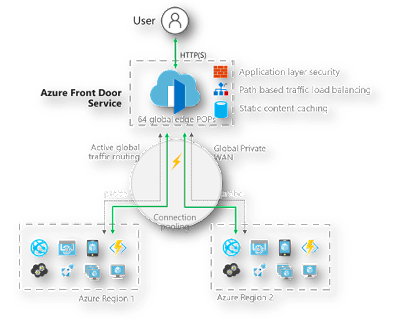 Enables independent routing all under your single global domain and will be powers global microservice applications. To monitor and gain insight into your user’s traffic and your distributed backend service’s health. Provides the customizability to enable you to suit your application’s core needs. If a user needs to migrate an existing global web site to Azure or building a modern application from scratch or just promoting your small business, along with the rest of Azure’s application delivery suite of products Traffic Manager, Application Gateway, Load Balancer, Azure CDN, and now the Azure Front Door Service.